Land-locked in the Middle Atlantic region of the United States, Pennsylvania has a 51-mile coastline on Lake Erie and 57 miles of shoreline along the Delaware River Estuary. The Delaware River forms the border between Pennsylvania and New Jersey and part of its border with New York. Other major rivers include the Allegheny, the Monongahela, the Ohio, the Schuylkill, and the Susquehanna. Pennsylvania is said to have more miles of river than any other state in the contiguous United States. About 3% of the Commonwealth is covered by water including 490 square miles of inland waters and 749 square miles of Lake Erie waters. What is Pennsylvania’s maritime heritage? Long before William Penn arrived in 1682, Native Americans used dugout canoes to traverse the area’s rivers. During the 1700s, the French, the British, and the Americans built forts on the shores of Lake Erie and along many of Pennsylvania’s rivers to protect trading posts, settlers, and towns, and control access to the Ohio River Valley. Philadelphia, at the confluence of the Delaware and Schuylkill rivers, served as a port of entry for immigrants and became a major seaport known for its shipyards. Pittsburgh, located where the Allegheny and the Monongahela join to form the Ohio River, also became known for its shipbuilding. Smaller ports and boatbuilding centers were established at Allegheny City on the Allegheny River, at Chester on the Delaware River, at Erie on Lake Erie, and at other places along rivers. During the American Revolutionary War, the Pennsylvania State Navy was created to defend Philadelphia from British naval attack. In 1801, the nation’s first naval shipyard was established in Philadelphia. In the early 1800s, the Commonwealth developed a system of canals with portages to transport canal boats over land between canals. The system spurred economic development but declined by the 1850s due to competition from railroads. Dugout canoes have been found in Pennsylvania’s bogs and lakes mostly in the Poconos. The oldest canoe, now on display at the State Museum of Pennsylvania in Harrisburg, was found in Mud Pond in Luzerne County and dates to the mid-13th century. Most dugout canoes are historic in age like the ones found in Hunt Lake in Susquehanna County and Curtis Pond in Wayne County. During the Revolutionary War, after the fall of Fort Mifflin and Fort Mercer, over two dozen ships including 10 belonging to the Pennsylvania State Navy were scuttled near Trenton to avoid capture and delay the British from attacking General Washington’s army at Valley Forge. In the mid-1980s, the Commonwealth’s Archaeology Program surveyed the area and found the remains of several of the burned merchant ships. In 1820, the USS Niagara was sunk for preservation in Lake Erie’s Misery Bay. Built and launched in 1813 at Presque Isle, Erie, Pennsylvania, the brig fought successfully under Captain Oliver Perry against the British in the Battle of Lake Erie during the War of 1812. After being sunk, the ship was raised but found to need extensive restoration and re-sunk. It was raised again in 1913 and restored as part of the Perry Centennial only to fall into disrepair. Restoration began for a second time in 1929 and was completed in 1963 for the Perry Sesquicentennial. In 1988, extensive reconstruction was undertaken and the ship became a floating museum and sail training vessel at the Erie Maritime Museum. Lake Erie serves as a shipping and transportation highway for the lake’s port cities in Michigan, New York, Ohio, Ontario, and Pennsylvania. Over the years, bad weather, fires, and collisions have caused many ship losses in Lake Erie. 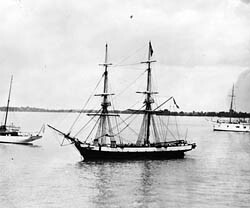 The wrecks of several dozen of these ships are in the waters of Pennsylvania near Erie. One of the earliest known losses is the armed sloop Detroit which had been purchased by the Americans from the British in 1796 and sank in 1797 while carrying military supplies. Three ships lost in a storm on the same day in 1880 are the steamer Aimie, the freight barge Bay City, and the schooner Eldorado. Who takes care of Pennsylvania's underwater archeological sites? The Pennsylvania Historical and Museum Commission is responsible for investigating, preserving, and protecting archeological resources located on lands owned or controlled by the Commonwealth, including any submerged lands. In an innovative public education and outreach program, the Commission’s Bureau of Historic Preservation has created several replica dugout canoes using replica Pre-Columbian construction techniques and tools. You need a permit from the Pennsylvania Historical and Museum Commission for archeological field investigations of shipwreck sites. Investigations must be undertaken for the purpose of disseminating the knowledge gained and the applicant must submit a report of the investigation, containing relevant maps, documents, drawings and photographs. All archeological specimens collected pursuant to a permit remain the exclusive property of the Commonwealth. What laws concern underwater archeology in Pennsylvania? Pennsylvania’s Historic Preservation Act is codified in Title 37 of the Pennsylvania Consolidated Statutes Chapter 5, §501 et seq. Other laws relating to the Commonwealth’s historical and museum programs begin in Chapter 1, §101 et seq. of Title 37. These laws direct the Commonwealth to preserve and protect its irreplaceable archeological and cultural heritage for the benefit of all the people to promote the public health, prosperity and general welfare. They also direct the Commonwealth to conduct a comprehensive historic preservation program for the enjoyment, education and inspiration of all the people, including future generations.